“I feel and I treat my kitchen as if it was my own restaurant. And I look at the food I put out as restaurant quality — the style, the garnish... I put my own twist on it every day,” he said. Mujanovic’s experiences - from his Yugoslavian heritage to his Italian culinary background - mean some of his favorite foods to make are homemade pizza dough, stromboli, and fresh pasta. 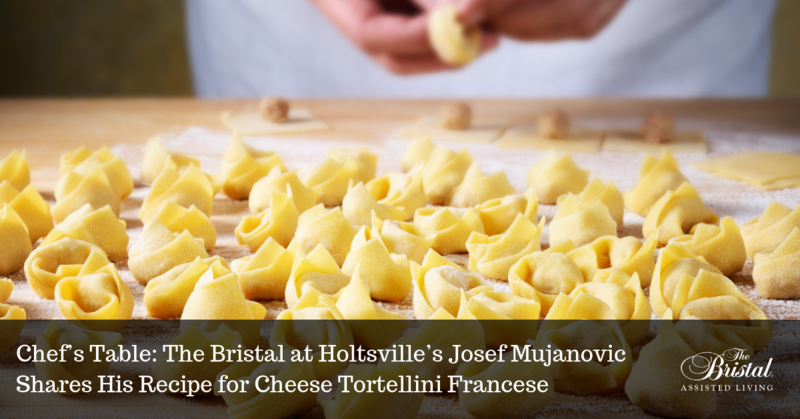 Here, he shares his recipe for a rich, from-scratch cheese tortellini in Francese sauce. Using the fresh pasta recipe, roll out your dough either by hand or machine. Cut into 3- or 4- inch rounds with a round cookie cutter. Place 1/4 teaspoon into the center of each round. Brush egg wash on the bottom half of the round and fold over to seal. Fold back around your finger and turn down the edge to form the tortellini.In half a gallon of rapidly boiling salted water, add the tortellini in batches. Cook for three to five minutes, or until they float to the surface. Remove to a strainer to drain.While tortellini is cooking, begin Francese sauce and glazed mushrooms. Next, in a separate pan, sautée sliced mushrooms in olive oil and amaretto honey, adding fresh rosemary throughout the process. Mix your finished tortellini with the hot Francese sauce in a sauté pan on medium flame until desired temperature (approx. four minutes). 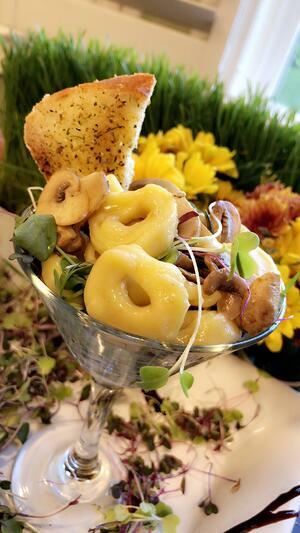 To plate, set a bed of pea microgreens, add the tortellini Francese, and top with amaretto-glazed mushrooms. Finally, garnish with rainbow microgreens or your preferred herbs and serve with Italian herb-crusted crostini.